What’s The 20th Most Complained About Show On UK TV? When somebody loves what they do, how can that enthusiasm not be infectious? Occasionally you are required to browse the information super-highway for things related to work. And, more often than not, on that journey you get side tracked by something in the way. A little like driving to Abergavenny and being stuck behind a caravan for most of the time on the A40. Which is interesting as I suspect that caravan owners are the biggest group of people to complain to the BBC about Top Gear. And it is the fact that, according to Ofcom, Top Gear is the 20th most complained about show on TV that stopped me in my tracks today. 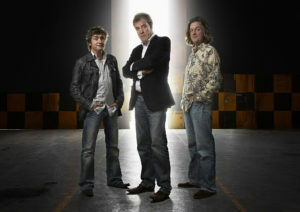 The BBC has – apparently – been forced to make a statement, “We acknowledge some viewers do not appreciate the Top Gear team’s sense of humour but their provocative comments are an integral part of the programme and are not intended to be taken seriously,” [Top Gear: 0 to offensive in 6.5 seconds from Guardian Unlimited: Organ Grinder] said Auntie. The thing is I, John Plunkett (who wrote the article for The Guardian’s website) and, I guess, millions of others love watching three blokes talking about cars on the telly. And I am not interested in cars that much. I’m not sure Jeremy Clarkson and I would get on very well (mainly because I wouldn’t be able to stop laughing at him) but that doesn’t stop me enjoying every word that he speaks. Richard Hammond is, of course, there to be both amusing and the totty to watch. And then there’s James May. You couldn’t have Top Gear without him but one of the great mysteries is why not. Ultimately, I love the banter between the presenters more than anything else. Except the bits about racing fast cars. I like that too. I am not surprised so many people complain. It’s often rude, politically incorrect and responsible for a large part of the hole in the ozone layer. It’s also funny, self-deprectaing and addictive television. It is, also, television made with passion. And that’s what makes it stand head and shoulders above much of the dross on the box at the moment. When somebody loves what they do, how can that enthusiasm not be infectious? Sunday nights. BBC2. Previous Previous post: Where Are My Palm Treo 650 SMS Messages?